Most of the visitors usually have the experience of travel in Phitsanulok city by tricycle at night because this is the famous package tour of Phitsanulok. You can view the town when you are on the tricycle, you will pass the commercial part of the town , pass the markets and ancient places also and you are not tired because there will be a chauffeur for you. To take the tricycle package tour. Make a reservation at the hotel counter you live in. It is safety for you. To go downstream through the rapids is the exciting and interesting activity. You will be fun and excited also. And you can view the scenery of the natural at waterfall along Kek river in Wang Thong District which pass many waterfalls. This will be the good experience for you and your friends. To get this package tour. Make a reservation at your hotel or at the resorts on the Highway number 12 ( usually at Sup Prai Wan Grand Hotel and resort in Wang Thong District Tel. (055) 293293 Fax. (055) 293339 or Bangkok office (02) 2373875-87 Fax. (02) 2383008. The time of the year to get this package is June to October. It takes two and a half hours to go downstream through the rapids along 8 kilometers. You must obey the guide very strictly because there are rather dangerous. And if you have children you shouldn't take your children to go downstream through the rapids with you. This package tour is suitable for all visitors. You can buy souvenir and local products also. You can go to night bazar your self by tricycle , by bus or contact your hotel counter . Night bazar located in the Nan riverside near Ekatotsarot bridge. This package tour is operated by TAT Phitsanulok which is very interesting , the route will pass many ancient and beautiful places such as Wat Phra Sri Rattana Mahathat or Wat Yai,the shrine of Naresuan the great, Nan Riverside Park,ect. 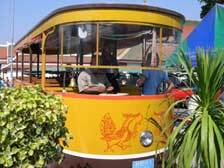 By using old history tramway which is safe also the fair is reasonable. The fair for children or student are 10 Baht, Adult 20 Baht. The route of the tramway begins at Wat Phra Sri Rattana Mahathat or Wat Yai - Nan Riverside Park - Houseboat Museum - Railway station - Clock tower - Chao Phraya Chakkree Monument - Ekathotsaroth Bridge - Talaeng kang - City Moats - Cha Nok Rong school - City Hall - Wat Viharn Thong - the shrine of Naresuan the great ( Chandra Palace ) - San Luk Muang the major respective shrine of Phitsanulok and end the trip at Wat Phra Sri Rattana Mahathat or Wat Yai. The price or the route of the tramway are subject to change without notice.